Dudley Childress, one of the first graduates of the biomedical engineering PhD program at the McCormick School of Engineering who went on to conduct important work in rehabilitation engineering, passed away Aug. 6 after a long illness. Childress’s pioneering work led him to be elected in 1995 as a member of the Institute of Medicine of the National Academy of Sciences. During his long career, he was a professor of biomedical engineering at McCormick, professor of physical and rehabilitation medicine at the Feinberg School of Medicine and the Rehabilitation Institute of Chicago, director of the Prosthetics Research Laboratory and the Rehabilitation Engineering Research program, and a senior rehabilitation research scientist at the VA Chicago Health Care System. “Dudley was one of a handful of people from Northwestern elected to Institute of Medicine, the pinnacle of his profession,” said Julio M. Ottino, dean of McCormick. “In addition to his innovative work he was one of the most gracious professors I have had the pleasure of knowing." He received his PhD from McCormick in 1967 and was the first biomedical engineer appointed to a joint faculty position in the medical and engineering schools at Northwestern. Throughout his career he worked at the intersection of engineering and medicine to develop numerous assistive devices for people with limb disabilities, including the first myoelectric system that allowed a prosthetic user to control the speed and grip force of the device’s fingers in 1968, a sip-and-puff wheelchair in 1972, and a state-of-the-art motion analysis system in 1998. For the past 45 years he was a mentor to many biomedical engineering students. In a 2002 article in the Journal of Rehabilitation Research and Development, Childress wrote that rehabilitation engineering must be a team effort that continually works to teach the next generation of researchers. 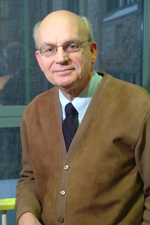 “I have learned that a rehabilitation engineering research center needs to be located where the investigators and staff of the center interact daily with consumers/clients related to the research effort…I have always contended that young graduate students and postdoctoral fellows with energy and new ideas are the lifeblood of a research center,” he wrote. Childress, who became a professor emeritus in 2004, was also known for his benevolence as a scholar, teacher, and mentor. Childress received numerous awards throughout his career, including the Veterans Affairs (VA) Rehabilitation Research & Development Service Lifetime Service Award, the da Vinci Lifetime Achievement Award, and the Amputee Coalition Ernest Burgess Lifetime Achievement Award. He was a founding fellow of the American Institute of Medical and Biological Engineering, an honorary member of the American Academy of Orthotists and Prosthetists, a member of the Institute of Medicine of the National Academy of Sciences, and fellow of the Institute of Medicine of Chicago. He is survived by his wife, Nancy, and two children. A memorial service is planned for September.